Tantei Opera Milky Holmes 10 out! 10 is out! Sorry for delays guys, raw and typeset problems, amongst holiday events, really slowed down this episode. Two more to go peeps! And for those people still unaware of the current struggle within the anime/manga industry, be informed here. Let’s all hope for the best! P.S. The typeset at around 12:20ish (codenamed “Extreme Manservice” as so not to spoil) was incredibly difficult to do, and even if we went through with it, CPU would surely skyrocket. So we commented the translation (still visible in script) and put a tl note instead. For you curious cats out there, the link with the info is here. Special thanks to doll_licca for the references. Les Miserables Shoujo Cosette 24 released! Les Miserables Shoujo Cosette 48 and 4 released! You shouldn’t overdo it with typesetting anyway. Sometimes simpler is better. No need to apologize. Apropos translation notes, there was one about who Julius Caesar was in one of your releases (not in Milky). These notes you should avoid. It’s a shame you guys aren’t more well known, these subs are good. We’re subs that are supposed to be forgotten. 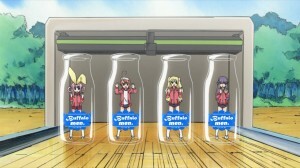 Next post Tantei Opera Milky Holmes 11 released! Previous post Anyamal Tantei Kiruminzoo 29 out!